Welcome to our November ‘vintage’ edition. 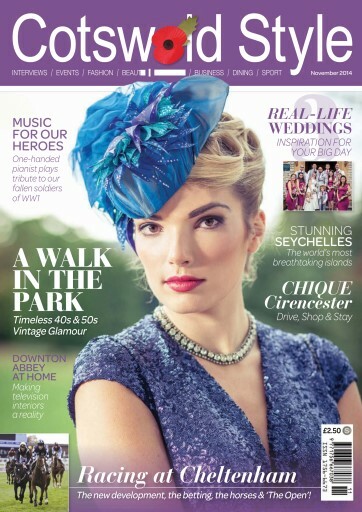 Our fashion shoot this month takes us back to the glorious vintage era of the 1940s and 1950s with stunning furs and hats among the dresses - appropriate this month for those dressing up for the second biggest racing meet of the year at Cheltenham, The Open. On this note we meet Ian Renton, MD of Cheltenham Racecourse, to discuss his passion for this prestigious racecourse and the redevelopment plans at Prestbury Park. We get betting banter from The Open with Betlive Radio’s racing pundit Nigel Aplin, who shares his best tips with us for this November. Our town spotlight this month is on Cirencester, the capital of the Cotswolds. We visit the successful shops and businesses in the town. Our travel writer reports from the Seychelles as she visits some of the world’s most beautiful islands. Plus our regular property pages, fitness, health and beauty, and your guide to the best events happening around the Cotswolds this month.